Should Leinster play Castres again in future versions of the Rugby Champions Cup, no doubt I will look back to this writeup to give me a sense not only of what the match was like, but also how the Irish rugby landscape looked “back” in 2016. Yet when “future me” clicks on that link it’s vital that I am instantly reminded just how the weekend transpired. Of course the Saturday was great...bonus point win for the boys in blue (I will harp more on it later), followed by Connacht later that evening who looked every bit the Pro12 champions they are as they dispatched four-time European supremos Toulouse in front of the Galway crowd. Then came Sunday which for me had been fully organised around being able to watch both Bordeaux v Ulster and Racing v Munster. Because that’s how it is with most fans of the Irish provinces...sure, we have strong rivalries amongst ourselves and these were played out only last weekend - but when it comes to Europe, particularly in the early rounds of the pool stages where our fortunes don’t cross paths in any way, only the tiny minority of cynical people (can’t even call them fans) wish the other three anything less than success. So there I was watching the events in Bordeaux unfold when I saw a tweet sail by my timeline which read - “Are those tweets about Anthony Foley true?” From that moment until the one where I read the official statement on the IRFU website, my imagination simply could not present me with a version even close to the horrible news contained therein. We normally post this on a Monday but held it over, not only out of respect, but also to allow 24 hours for all those who actually played with and for him and had any kind of dealings with him to give their own responses. I certainly don’t want to give any kind of impression that I knew the man personally. Still, it’s very hard not to have news like this affect you. Of course you feel it on a personal level...he was a father like myself and was a few years younger, which certainly gives you a sense of perspective when it comes to things happening around you. But ultimately when you can bring yourself to look past the shock, sadness and personal connections to the news, at least you can find some sanctuary in the memories he left behind, and there were many. The one that sticks out most of all has to be the Heineken Cup semifinal at Lansdowne Road in 2006, not exactly a happy occasion for a Leinster fan, but a great one nonetheless. After a stunning quarterfinal victory in Toulouse it was time to step up and claim what we somehow felt was ours, or so many of us thought. Instead we were easily put to the sword to a Munster side, led by Foley, which had already lost two finals and were laser focused on getting the job done. Having been all over us right from the kickoff, they won a penalty in a very kickable position for Ronan O’Gara but his skipper had only one thing on his mind...put that in the corner ROG so our forwards can get to work. Moments later it was Denis Leamy falling over the line after a perfect lineout take from Paul O’Connell and a well-drilled maul from the pack with the red-capped Foley in amongst them. Though as I mentioned earlier I didn’t know him as an individual, that sequence did represent the impression I had of him as a player...not seeking the limelight despite being heavily influential on those around him. Of course Axel also had his 62 caps for Ireland when I was most definitely cheering him on. Towards the end of his test career he was involved in a great Irish win over England in 2005 that springs to mind, and at the time that was a period during which rugby on these shores was on the rise. But the Triple Crowns and one-off wins weren’t quite enough...it wasn’t until that day in Cardiff in 2006 (major kudos to Sky Sports for their special screening last night) that we really had something to celebrate. And yes, I mean we. 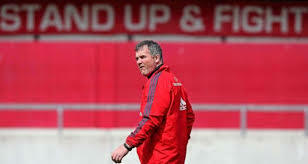 Of course I was disappointed to have lost that semifinal but I have no shame in saying that I was absolutely over the moon to see that great Kidney/Foley- inspired Munster side go on to take the title that day. I wasn’t there myself but I was in one of the most Leinster-centric pubs not in the immediate vicinity of the RDS, namely Gleesons of Booterstown, an establishment with strong links to Blackrock College. Take my word for it...it wasn’t just those wearing red jerseys who were cheering that day and I distinctly remember noting the giddiness Foley displayed before being handed the trophy...you couldn’t be anything but delighted for him and everyone associated with Munster at that moment. When tragedies like this occur we hear about the “rugby family” and that is a perfect way to describe it. Tributes have been pouring in from all over Ireland, all over Europe, all over the world...and it is amazing to know those levels of support are there. And what of Leinster v Castres? Well what can I say after opening this writeup the way I did. In many ways it doesn’t really seem to matter, though in other ways it’s important that we pay our respects and move on as best as we can. Let’s just say I’m not really in a mood to be all that analytical this week, but it just so happens this wasn’t really a match fit for too much analysis anyway. Simply put, Leinster were up for it, Castres weren’t. French sides are known for not “travelling well” and this particular one has a bigger reputation for that than most. But on our side of things, it was imperative that we put the disappointments of last season’s opening European fixture behind us and we most certainly did, ironically scoring the same amount of points as Wasps put on us that day. And not unlike that great Munster team from 2006, we showed a lot of confidence in our lineout/maul set-piece, and in that first half in particular, it pretty much guaranteed us a try every time and we had three in in the first forty minutes. Strangely despite our early dominance the halftime score was just 19-10 and with Luke McGrath yellow carded for tampering with the visitors’ own maul which led to their penalty try just before the break, we still had a lot of work to do to set about earning the four match points, let alone the five. Thankfully we needn’t have worried and the result wasn’t really in much doubt...in fact, we got the bonus point try courtesy of skipper Isa Nacewa while still a man down, and added a fifth later thanks to dominance at the scrum. Josh van der Flier won man of the match but there were good performances all round. I was most impressed by our 10-12-13 combo of Carbery, Henshaw and Ringrose...of course a certain Mr Sexton belongs there in ideal circumstances (in fact the moment of the day was when his face popped up on the big screen and everyone laughed, including himself, at the realisation that he wasn’t needed) but that particular trio offered so many attacking options given their propensity to dance through tackles for gainline breaks you have to wonder how they’d do after playing together for a prolonged spell. Now we move on to Montpellier and arguably the toughest test in this pool. But I can look to that later in the week. Right now the only rugby occasion worth mentioning is Munster v Glasgow Warriors in Thomond Park next Saturday, with the provincial board confirming today that it is going ahead.